Once you make your own Instant Pot Kalua Pork with just a few simple ingredients…you will never have to go to Hawaii…for the infamous pork at least!! So simple and so delicious, this tender pulled pork will quickly become a family favorite…it doesn’t hurt that it is naturally gluten free, paleo, Whole30, and low carb! I love this meal for so many darn reasons!! Every single family member LOVES it! (That is major points in this mom’s book!) Mom win. Total crown pleaser, and SO easy to make for a big group! I have been making this for a couple years now, and it never disappoints. So simple, And the fall apart pulled pork of your dreams is at hand. If liquid smoke is new to you…don’t worry—-it is actually pretty easy to find in any well-stocked grocery store. Just be sure and read labels, as some companies like to put in unnecessary junk…you want pure liquid smoke concentrate! Wright’s is a common brand, and I have linked to a great one below! atop a bed of coleslaw for a low carb version….my favorite! I use my homemade mayo to control the ingredients and take the flavor to a whole new level…it’s all my family will eat now, one taste, and I bet you will be the same! with some gluten free mac salad, here’s a recipe you could try! Add some cabbage wedges into the pot when the time is up…then the cabbage cooks in the juices as you simmer it down, magical! 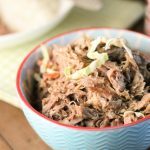 Can I make Kalua Pork without an Instant Pot? While the Instant Pot certainly saves you on time and clean up, stove top works too! You will need a lot more water to cover the meat, then cover and simmer with the lid ajar for several hours until meat is fall apart tender and most of the liquid is gone. More Instant Pot Main Dishes to Enjoy! 1 tablespoon liquid smoke read labels, some have weird additions! 3 tablespoons mayonnaise I use my own....more tasty, and safe ingredients! In the insert of an Instant Pot, place all ingredients. To speed cooking time, use smaller pieces! I roughly chop my roast into 4 large chunks. Add 2 cups of water (hot water if you want it to come to pressure quicker!). Lock on the lid, and set "manual' time for 80 minutes. Once time is up, hit 'cancel," do a quick release, and remove the lid. Hit the "saute' feature: time to simmer that uninspiring soupy pork down! Simmer away until most of the liquid is gone, stirring occasionally. Pork should be shredding easily while you stir. Mix the mayo, minced onion, and apple cider vinegar all together, then toss in the cabbage slaw! It’s amazing that you can make something so flavorful with only four ingredients — thank you Intstant Pot! YUM!!! with that hot sauce on top, omy! I’ma gonna need some white rice with that. 😉 SUPER can’t wait to make this! So delicious! My picky daughter asked for 2nds and thirds! Awesome Kelley, so glad you all enjoyed it! Oh I absolutely have to try this! It looks like something everyone in my house will love! Adding this to our meal plan this week! I’m already drooling! 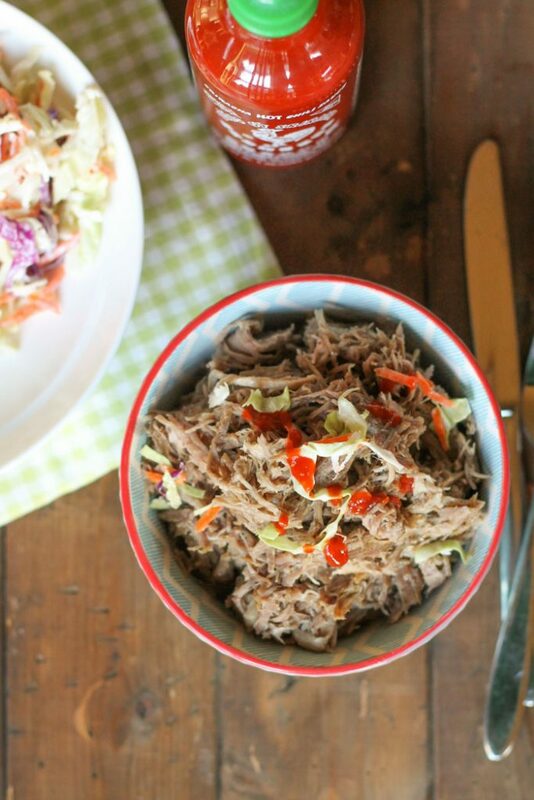 I love pulled pork and this coleslaw looks delicious! Looks and sounds SO good. I never use liquid smoke so wonder if there’s anything you can suggest that I can substitute. Will definitely enjoy with coleslaw which sounds just perfect combination! I love kalua pork. It’s so delicious and naturally sweet. Simply delicious! I haven’t done pork in my InstantPot yet, so now I know where I’m starting! Love how easy it looks. Oh yum! 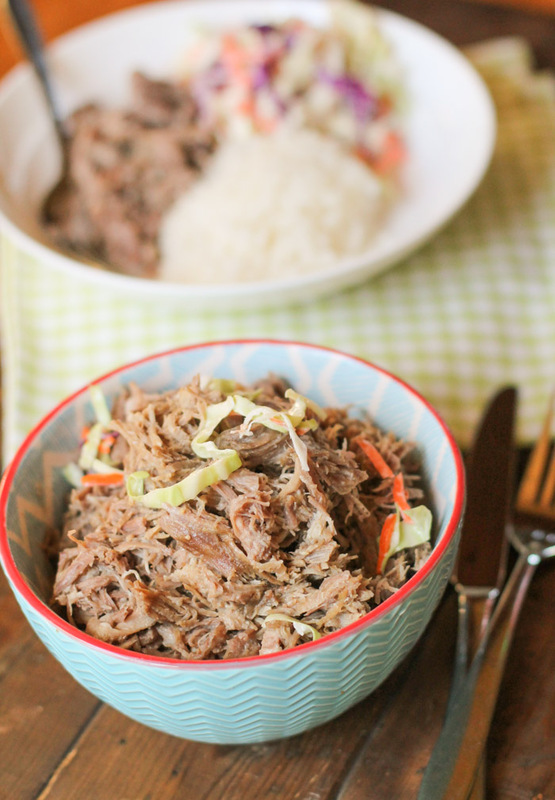 I looove Kalua pork and it’s so easy in the Instant Pot! Bookmarking to try out soon. I had no idea this recipe could be so simple with such few ingredients, so cool! Can’t go wrong with that tender IP meat too and mixed with this east slaw, it makes the perfect, delicious meal. I love the idea of serving this with coleslaw- I could totally dig that! Thank you for the IP instructions – I am not as good at meat in the IP! Thanks! Renee D Kohley recently posted…Gluten Free Dutch Apple Pie :: Plus Tips For Including Your Kids While Making It! Wow, only 4 ingredients?? I never would’ve guessed you could make something so tender, flavorful, and wonderful with only 4 ingredients! Love the flavours. I really enjoy pork with coleslaw! I don’t have a lot of experience with my Ipot.. If I have 2 pounds pork.. Can u please advise re adjusting the pressure time. I would think I still need some water.. but not necessarily 2 cups, right? Appreciate any feedback. Thanks in advance! 1 cup is always the general minimum for an IP, in this case, go ahead a rcue it…either way, you reduce the remaining liquid at the end, so less cooking water is not an issue! Sorry it look me so long to respond carol!